Here is the library! 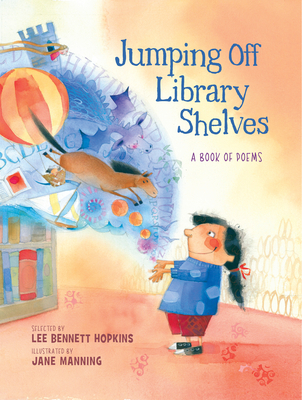 Fifteen poems celebrate the thrill of getting your first library card, the excitement of story hour, the fun of using the computer, the pride of reading to the dog, and the joy of discovering that the librarian understands you and knows exactly which books you'll love. The poems, compiled by noted poet and anthologist Lee Bennett Hopkins, pay homage to the marvels of books and reading. Accompanied by Jane Manning's colorful, imaginative illustrations, this collection celebrates the magic of libraries and is a must for every school and public library. Lee Bennett Hopkins is a poet and anthologist and has been honored with the Christopher Award, the University of Southern Mississippi's Medallion for "lasting contributions to children's literature," and the NCTE Award for Excellence in Poetry for Children. He lives in Cape Coral, Florida. leebennetthopkins.com.